If there’s one thing that hasn’t changed since the first time someone thought of eating a chicken, it’s the belief that a good chicken broth is good for your soul especially when there’s a nasty cold getting you down. Isn’t it (unless you’re vegetarian or vegan, in which case there’s something else)? But what is it about chicken broth that clears you up, has you feeling warm, cosy and on the mend? For my chicken broth, I pack in as much flavour from herbs, spices, vegetables and of course, chicken, to get every last drop of goodness from each ingredient. It’s not a small list, mind you, but it’s worth gathering as many as you can. If you don’t eat chicken, just make the broth with everything else and you’ll still be a winner! 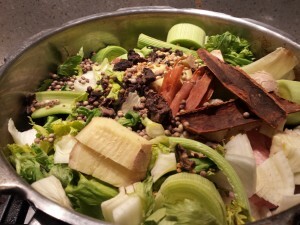 Phew…cook that in a kitchen sink and you’ll never fall ill again! I’ve tried and look for a vegetarian alternative to chicken but it seems that the best thing is chicken because of their unique amino acids that reduce mucus production, but you can still make good use of everything else in there! 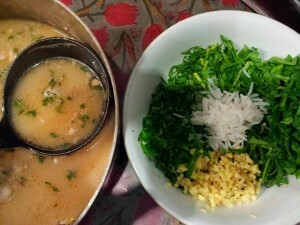 Once the broth is done, chop up the chicken into small pieces and add it to the strained broth along with some parsley, coriander, rice and spinach. I like throwing some chopped fresh ginger as well. Keep in mind, this broth may be a bit intense if you don’t have a cold – it’s meant for when your taste buds give up on you!